Thanks to EPIC Scholarship I had the incredible opportunity to attend the IPPS 3rd World Congress on Abdominal and Pelvic Pain in Washington DC. Since returning home I have had the opportunity to discuss the conference at length with anyone who would listen, or even pretend to listen, or anyone who happened to be in my general vicinity and didn’t tell me to shut up. Through these conversations, I realized there were a few common themes throughout the conference. First and foremost there was an emphasis on the biopsychosocial model of treatment. In grad school, we were taught to treat the patient as more than just their injury or body part, but the information from the lectures really helped guide just how to do that. The biggest message was that none of us are good enough... bear with me... None of us are good enough ON OUR OWN. To truly do what is best for our patients we must surround ourselves with a trusted team from a wide variety of specialties. Depending on the patient, they may need physical therapy, surgery, injections, medication, CBT, change in diet, or most likely, a combination of these treatments. None of us can wear all these hats, and there is no single right answer. Every patient is different and as providers, we need to be able to adapt and look beyond our own biases to provide the best possible treatments for the patients that are putting their trust in us. This means being more willing to refer out to other providers. The next standout concept was that we are incredibly complex beings. You can’t treat the conditions we see without considering the changes that happen at the molecular and cellular level. These changes extend all the way from peripheral nerves to the spinal cord and even into the brain. The presenters at the conference did an amazing job explaining these complex systems, even using Holly Herman as a neuron at one point! What I learned is that the available treatments that directly affect these systems, like pharmaceuticals, have unintended side effects in many other areas of the body. This can all get very complicated and overwhelming until we realize that our bodies are incredible and already built to deal with these issues in-house. Over and over again we heard how CBT, breathing, nutrition, and exercise can modify these small-scale systems to address larger scale deficits WITHOUT SIDE EFFECTS. The other conclusion to draw from this information is that our words matter. What we say and what the patient perceives can have a massive effect on their symptoms. The other major theme I found was that we need to get patients to the right treatment faster. It was incredible to learn just how quickly our bodies and our brains start adapting to injury. Once this occurs the changes can be very difficult to reverse. The wealth of information I brought home came from many sources beyond the conference content. The conversations that went on between and after the lectures were stimulating and informative. I learned invaluable lessons from the other attendees. Besides bringing home lots of new knowledge, I also expanded my personal web of support. Everyone I met was open, eager, and ready to be part of something bigger. Across the many disciplines, I found everyone to be motivated by providing the best possible care for their patients. Now I know if I have a question or a complex patient there are other providers I can turn to for help. This experience was incredible in so many ways and would not have been possible without Sandy Hilton, Sarah Haag, and Lorimer Moseley. I am grateful beyond words for the opportunity they provided. Wynne Tezak is a physical therapist in Alpena Michigan (way up in the boonies). She is obsessed with, ahem, specializes in pelvic health. Through extensive community education she has been able to lure many unsuspecting citizens into taking control of their own bodies and health. 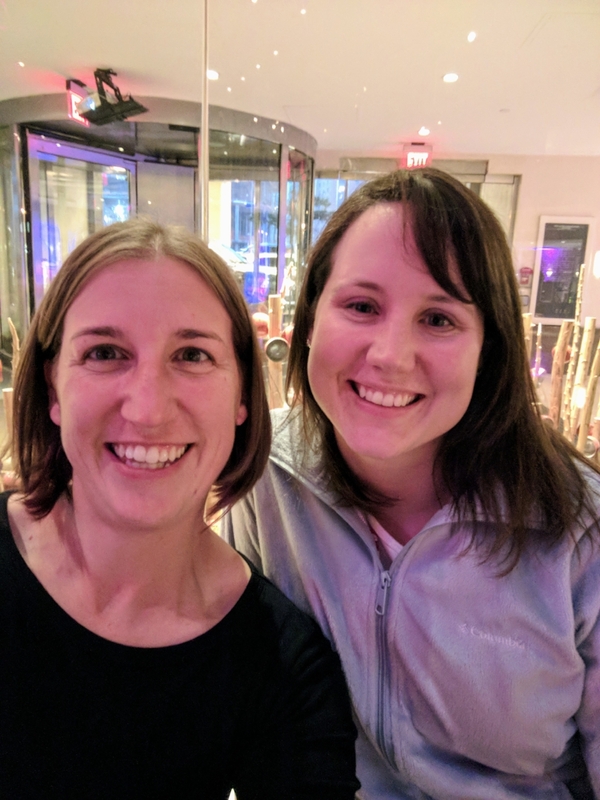 Thanks to the EPIC scholarship Wynne and her fabulous PTA Sarah Schnell (right) were able to attend the World Congress on Abdominal and Pelvic Pain, where they filled their brains to the brim and made valuable connections with leaders in the field.